UBA AWOOF WONDER STILL ON! WIN LOVELY PRIZES. 20 PEOPLE TO WIN 3 DAYS STAY IN DUBAI!!! 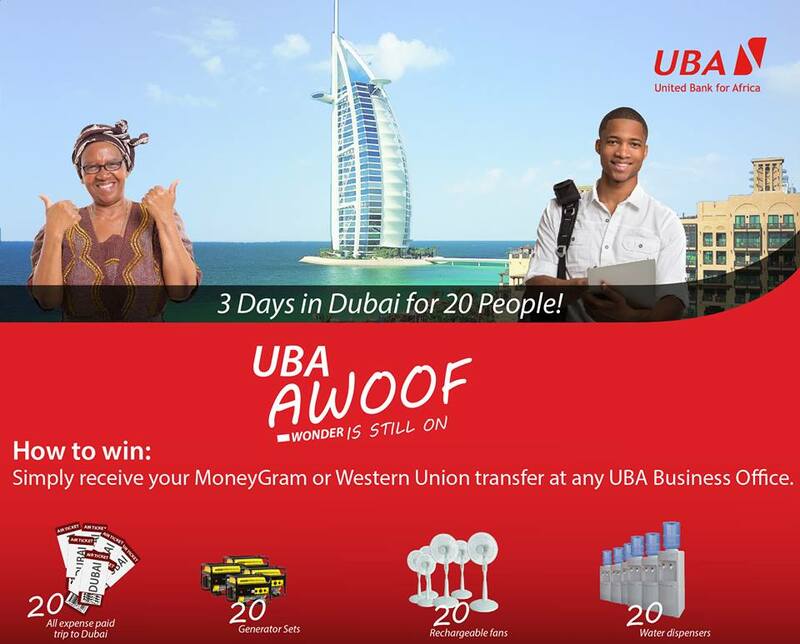 Its the "UBA AWOOF WONDER PROMO"
Simply receive your Moneygram or Western Union transfer at any UBA Business Office to Stand a chance to win. 1. 20 People to win an All expense paid trip to Dubai. Just receive your Western Union or Moneygram Transfer Via UBA ??? Ok my people lets start rating these Promos so companies will know what your thoughts are on their promo ideas. This will definitely help them improve on their Promos. *As for me this one is "Excellent" I really love the Prizes.